We've been talking a lot about Dry Eye Syndrome and its causes and treatments, so I thought it was about time to address punctal plugs! When my patients can't get relief from their dryness symptoms with artificial tear drops, I always suggest we try either Restasis or punctal plugs as our next option. Restasis is a prescription drop that improves production of the patient's own tears. There are some drawbacks however. Punctal plugs are another option when Restasis isn't the appropriate direction due to the above complications. 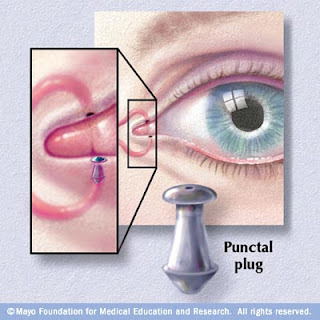 Punctal plugs are small collagen or silicone cylinders, typically less than 1 mm in width and around 3 mm in length, that are inserted into the puncta of the eyelid. The puncta is the drainage opening of the eyelid, where tears drain down into the nasolacrimal duct. If we "plug" the puncta, tears are collected onto the eye for a longer period of time. If your tears are staying on the eye longer, you will be experiencing much less dryness. Not everyone is a candidate for punctal plugs. If you have blepharitis/meibomian gland dysfunction/ocular rosacea symptoms that are greatly flared up, plugs will keep the inflammatory mediators on the surface of your eye which results in more redness and irritation. We have to treat this inflammation first before plugs would be a good option. I preferably insert dissolvable collagen plugs into the lower puncta of each eye. Some doctors may also insert plugs into the upper puncta in cases of severe dryness, but this is much less common. Dissolvable plugs are placed all the way into the puncta, so they are not visible when you look in the mirror. They typically last 3 months (and as long as 6 months) before being completely dissolved. That means that they would need to be replaced on a regular basis to offer continue relief. 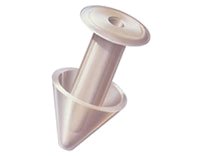 The benefits of dissolvable plugs is that there is very little infection or inflammation risk. Collagen plugs insert fully into the puncta and are not visible to the patient. I use Eaglevision Durasert plugs most frequently of this type. 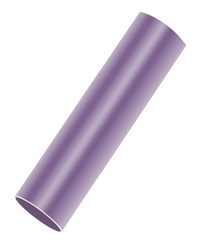 Silicone permanent plugs are also available and offer longer term relief. They typically sit on top of the puncta so that they could be removed with tweezers if needed. While these plugs are permanent, if you have an eye infection it is best to remove them and then have a new plug inserted when the infection is cleared. They can also fall out (especially if you are rubbing your eyelids quite a bit), or fall down into the tear duct. If these plugs fall down inside of your tear duct, they aren't dissolvable so they will always be there. If they need to be removed, they can be either irrigated or surgically removed. Because of this risk, I tend to insert dissolvable plugs more frequently. Permanent plugs: I find that the Parasol plugs are very easy to insert and remove. Oasis is also a very nice brand. On the day of your punctal plug insertion, expect the procedure to be surprisingly fast and easy! Almost all of my patients are apprehensive at first, and then are surprised when I am finished that the procedure was already over. Your doctor may first insert a drop to numb your eye, just to make you more comfortable during the procedure. In the microscope, they will first use a device called a "dilator" to open your puncta to ease the insertion process. Then it is time for the plugs to be inserted. Temporary plugs have to be inserted further into the puncta so they may take a little longer to put in place compared to the permanent plugs that sit on top of the lid margin. Usually everything is finished in less than 10 minutes. The first day you may experience mild discomfort around the inner corner of your eyes, but symptoms should be no worse than that. Marked pain or discharge should not occur. Just make sure not to rub your eyes too much because the plugs can come dislodged! After a day or two at most, you shouldn't even be able to feel that something is there! When Should Plugs Start Working? This depends on how dry your eyes were prior to plug installation. You have to give your eye time to heal -- and dry eye can be ongoing for years before some patients seek treatment, so we are trying to reverse years of damage. On average, I expect patients to be feeling significant improvement if plugs are going to be effective treatment in 1 month, but it could be much faster for milder cases. I have had patients note improvement as quickly as within a week! Tags: dissolvable plugs, dry eye syndrome, permanent plugs, punctal plugs, restasis, when should plugs start working? My doctor charges $1,750 for the punctal plug procedure to all four ducts. Is this average or high? Without knowing exactly which punctal plugs they are using, it's difficult to know. It's always possible to call around to other area providers and get price quotes for the recommended procedure! Your doctor would have to check within the slit lamp microscope to see if the plugs are visible.